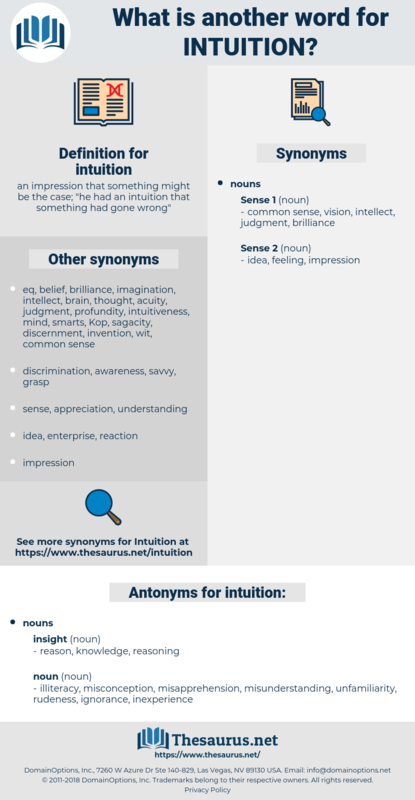 What is another word for intuition? 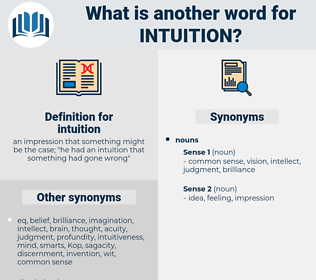 an impression that something might be the case; " he had an intuition that something had gone wrong"
illiteracy, misconception, misapprehension, misunderstanding, unfamiliarity, rudeness, ignorance, inexperience. In a sudden flash of intuition everything was clear to me. She had liked him from the beginning and from the beginning she felt that in a case such as his she would have trusted to intuition and have held back nothing. gnosis, insight, immediate apprehension, inspiration, intuitive feeling, sixth sense, feeling, immediacy.